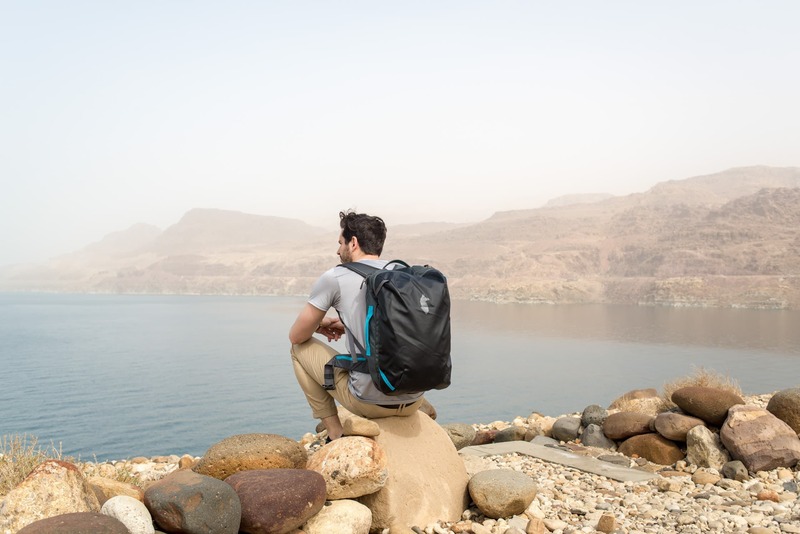 The Cotopaxi Allpa 35L Travel Pack is a great all-around bag that is smartly designed for carry-on compliance and can suit both urban and outdoorsy travelers alike. Cotopaxi has the depth listed at 13" instead of 9" - we've found it to pack and wear slimmer around 9"
Cotopaxi is the name of an active stratovolcano in the Andes Mountains, in Ecuador. It’s also the name of a company that manufactures outdoor gear and is trying to do some good in the world. We’ll let you guess which one this review is about. Founded in 2014 as a Certified B-Corp, Cotopaxi donates 2% of their revenue to help alleviate poverty. 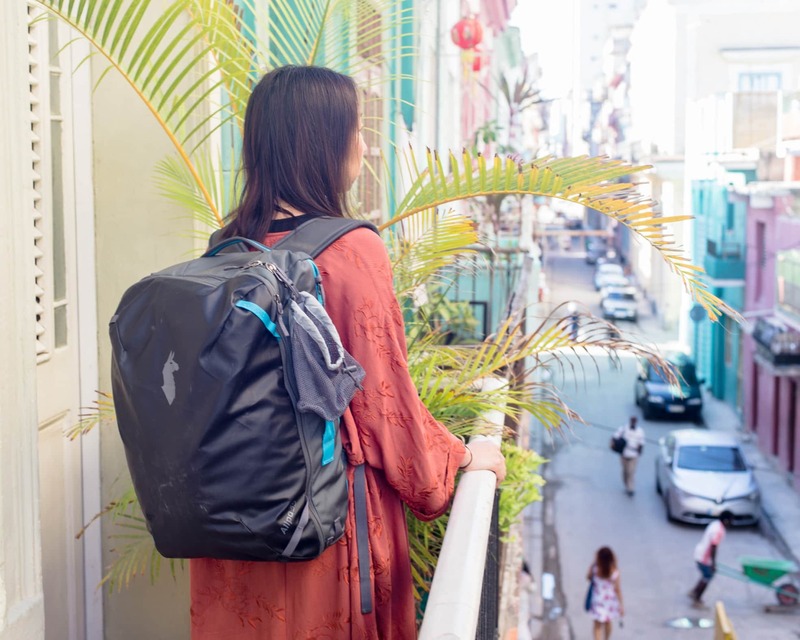 They also partner with “organizations like International Rescue Committee, Educate Girls, and Proximity Designs to provide health, education, and livelihoods in developing countries.” They do great work and make great products, one of which is the Allpa 35L Travel Pack. The Allpa is a 35-liter, carry-on compliant pack possessing many great features and design elements. Weighing 3lb 7oz (1560g) and measuring 20 x 12 x 8in (51 x 30 x 20cm), it’s on the heavier side of things compared to other bags with the same capacity—though it isn’t egregiously hefty. 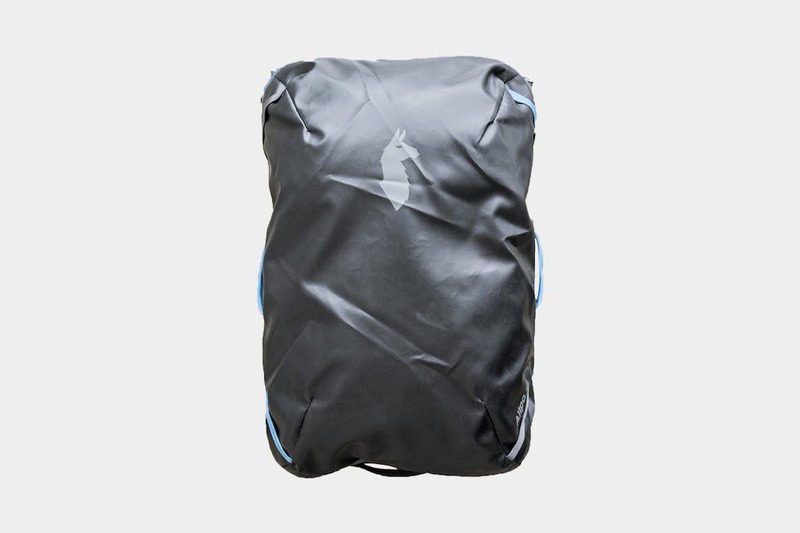 Much of the weight comes from the sturdy materials Cotopaxi chooses to use: TPU-coated 1000D polyester makes up the front of the pack while 1680D ballistic nylon comprises the side, top, and bottom paneling. This combination gives the Allpa a toughness that’s hard to beat. They also have a 28-liter pack available if you’re looking for something a bit smaller. There are three configurations to choose from when purchasing this pack. There is no difference in the pack itself, just the accessories that come with it. The Allpa as a standalone bag. The Allpa plus an accessory bundle that includes mesh laundry bags, a nylon shoe bag, and a snap-on mesh water bottle sleeve. The Allpa plus accessories and also Cotopaxi’s Batac Daypack. We chose the last option, although it’s not entirely necessary to get the full kit. While the pack is heavy, much of the burden is taken off your shoulders by a weight-distributing, low-profile harness system that Cotopaxi says they’ve taken from their hiking packs. This system consists of contoured shoulder straps, a padded, non-removable hip belt, a breathable airmesh back panel that does help keep the air moving (though you’ll still sweat a little), and an adjustable sternum strap that’s nice and sturdy. It’s very comfortable to carry and fits quite well for most people. We did find one issue with the functionality of the hip belt that may affect taller people, but more on that later. Access to the interior of the bag and all its contents is easy and well thought out. The Allpa opens suitcase-style, thanks to a full-wrap zipper on the main compartment. Looking at the open bag, the right side consists of a sizable zippered mesh compartment and the left is subdivided into three zippered mesh compartments—one large compartment on the bottom and two smaller ones at the top. If you need to access anything in the main compartment without opening the bag suitcase-style, you can do so via a shortcut zipper along the side. This is incredibly helpful if you need to go into a bathroom stall at an airport and grab some item of clothing for a quick change. You can hang the pack on the back of the door in a stall and access the contents through the side instead of laying it down on the floor (gross). Back on the outside of the pack, there’s a nice-sized pocket on the top, which is ideal for small items like your passport, a notebook, or some packaged foods. It’s also subdivided inside for increased organization and has a key clip. The Allpa can house both a laptop and tablet, too. 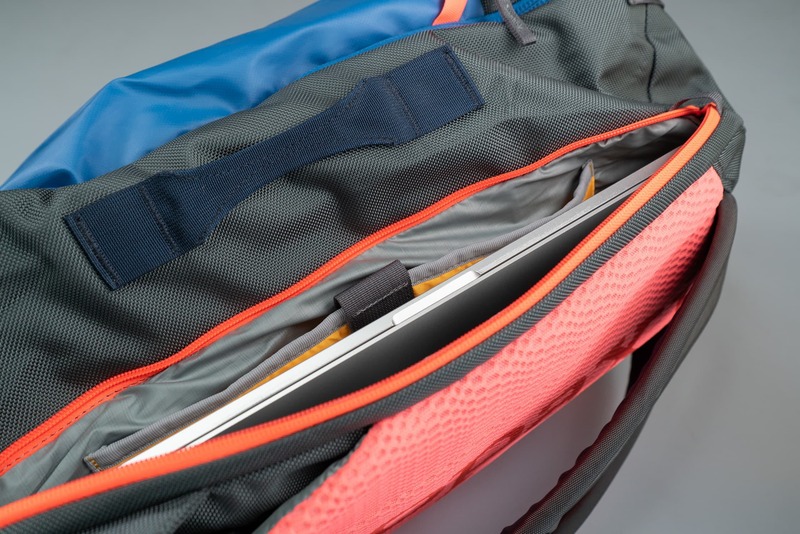 Opening up a zipper on the right side reveals padded laptop and tablet sleeves, with the former easily able to hold a 15” machine. 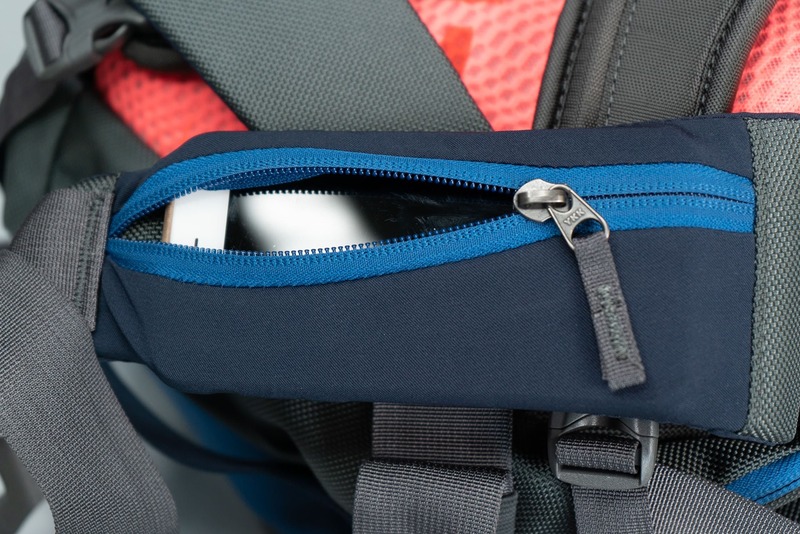 If you’re worried about theft of your laptop or any other valuables inside the pack, Cotopaxi has you covered with an interesting and minimal security measure. 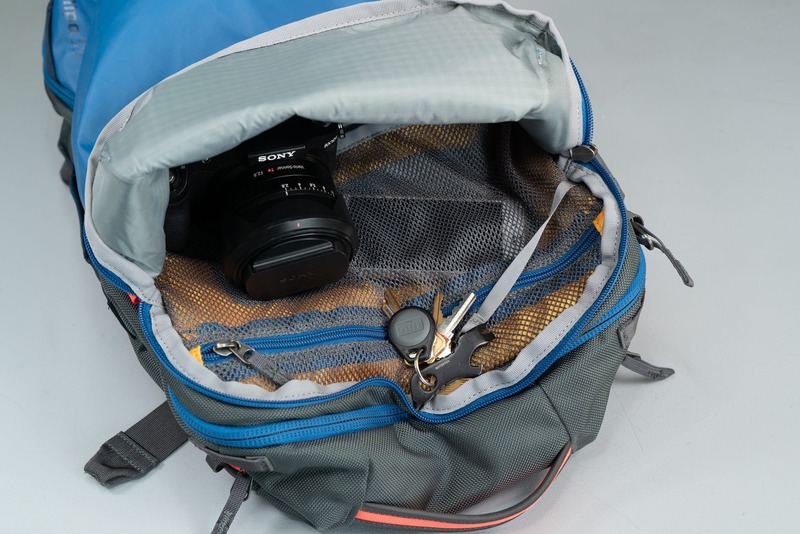 All external zippers on the Allpa feature theft-proof webbing sewn across the openings, which makes it difficult for someone to grab a zipper and easily unzip the pack in a clandestine way. Rounding out the features are the slotted back panel, which houses the shoulder straps and hip belt, four reinforced grab handles on each side of the bag, and a high-visibility rain cover that’s easy dawn when needed. The cover doesn’t have a designated storage area like some other packs do, so you’ll have to just throw it inside the bag. If you want to tuck away the shoulder straps or hip belt, all you need to do is tuck them into the four exposed corners of the slotted back panel. Those four grab handles are perfect when the bag is in this state, and they’re easy on the hands, too. Bigger items, like shoes, pants, and sweaters will have to go into the larger compartment on the right. Smaller items like socks, underwear, and toiletries, to the left. Even smaller items, like extra batteries, chargers, and pocket notebooks, in the two zippered pockets on top. The top zippered pocket on the outside is well placed, easily accessible, and just the right size. It perfectly holds a medium-sized Magpul DAKA pouch and some smaller essentials, like sunglasses and case, pens, and a small bag of trail mix. Another plus is that even if the main compartment is almost completely full, this pocket it still usable. We can’t say it’s completely liter independent because we did notice that if you really jam-pack that main compartment this one will be ever so slightly affected. We actually never brought a laptop or tablet with us on the trips where we’ve tested the Allpa, but the laptop and tablet compartment is versatile enough to hold other things, like a piece of artwork purchased while traveling or important printouts needed for your accommodations and activities at your destination. And having four sturdy, easy-to-grab handles may seem like overkill but it really isn’t. At one point, we had a taxi driver in Cuba pick the bag up out of the trunk of his car using the bottom handle. It wouldn’t have been so easy otherwise. There aren’t many more positives to mention with the Allpa, and that isn’t a bad thing. This pack really is a no-nonsense, no frills item. It does what it should do, and it does it very well without any fuss. 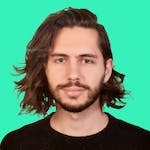 There are a couple of issues we found while testing. The first only applies to people on the taller side with a large torso size of large. If you’re one of these people, the hip belt will be virtually useless to you. Since the pack isn’t very tall, the hip belt won’t be able to sit as it should (on top of your hips). We found that you can tuck the hip belt into the slotted back panel to get it out of the way, though this created a protuberance along the bottom of the back that can be a bit uncomfortable, as it sits up against your lower back. The second issue is the usability of the small pockets on the hip belt. First, they’re very small. For some reference, it’s quite difficult to get an iPhone 6 in there. And even if you fit it in, the pockets become so taught when wearing the hip belt it would be quite a chore to put anything inside. These two pockets seemed like an afterthought to us. Surely if this feature was put through adequate testing it wouldn’t have made it into the final product. Good look and feel with great functionality. The only drawback is the rather useless hip belt, but that should only affect taller people. Two international trips to vastly different climates, as well as a few shorter and closer jaunts, and the bag is still as good as its first day. Ample space and smartly-placed pockets, both internal and external. Solid. This is one rugged pack. Quite heavy for its size. The hip belt isn’t functional for taller users, nor is it removable. The hip belt pockets are much too snug and nearly useless when wearing the pack. 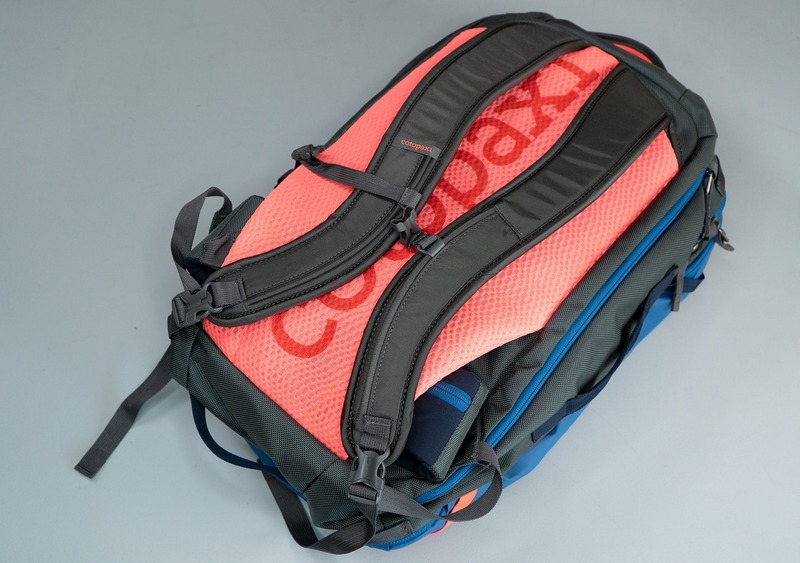 The Cotopaxi Allpa 35L Travel Pack is pleasantly hard to characterize. It can function as both a hiking pack, a work bag, or a travel pack. After our tests, we feel that it fits the travel pack role best. With it’s carry-on compliance, refined design and ample space, the Allpa is a great choice for anyone looking for a bag suited for a long weekend or a shorter vacation. While it may not be well received by taller users, if you find it comfortable to wear you won’t be disappointed.